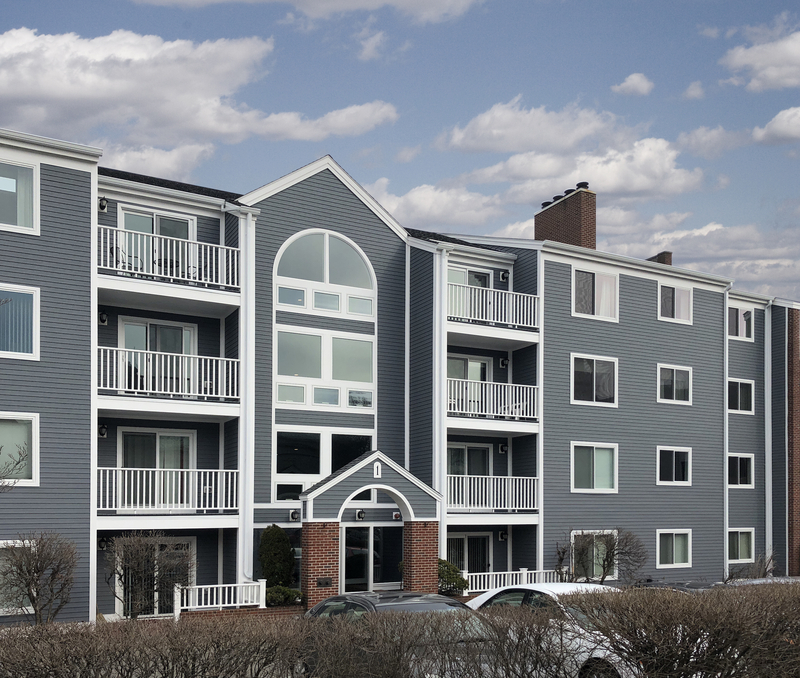 OAKMONT, PA (November 12, 2018) – Originally built in 1980, the condominium building located at 1 Washington Street in Salem, MA recently underwent a complete building envelope replacement featuring Everlast® Advanced Composite Siding, 4-½ inch planks in Flagstone color. The condition of the building showed an obvious need for exterior renovations. The aging cedar siding had failed, and the appearance and performance of the building envelope had diminished significantly. For buildings located within this historic area of Salem, the Salem Redevelopment Authority (SRA) typically requires that building owners only replace siding with new cedar or a fiber cement alternative. However, in this case, when presented with Everlast® composite siding, the SRA made an exception. The exception was made based on the numerous advantages Everlast® composite siding has over both real cedar and fiber cement. Everlast® replicates the look and texture of real cedar without weathering and deterioration, preserving the historic quality and overall character of Salem. And unlike fiber cement siding, Everlast® offers superior water and fade resistance, requires no caulking or painting, and contains no organic material that can rot or be attacked by wood-boring insects. As a result, the SRA voted unanimously (4-0) to approve Everlast® siding for the entire exterior replacement. 1 Washington Street now features more than 1,800 individual planks of beautifully embossed Flagstone grey Everlast®. The SRA, who is in charge of “preserving the social fabric and architectural heritage of the city,” also ensures that all building exterior renovations located within Salem’s Urban Renewal Area undergo an assessment by the Design Review Board (DRB). According to the City of Salem Commercial Design Guidelines, using materials not compatible with nearby buildings should be avoided, as they will make a development “stand out and appear jarring.” With Salem’s long history of wood buildings, the use of composite siding is only acceptable when, by the DRB’s standards, the material displays the proper detailing and finishing. Everlast® easily exceeded these standards. The contractor on the job, Schernecker Property Services (SPS), presented the proposed replacement of the condominium’s roof shingles, siding, decks, and windows to the Salem Redevelopment Authority. “We explored alternative options like vinyl, cedar, and the fiber cement products that are typically used in the area. We love Everlast® and after introducing it to the client, they thought it was a great product too,” says Thomas Daniel, Vice President of Schernecker Property Services, Inc.
Everlast® is also much easier to install than real cedar or fiber cement siding. It is lightweight, yet extremely durable, and features Everlast® siding’s EZStack design that assures each plank seats firmly in the one below for a secure fit and level installation. And after installation, Everlast® will never peel, flake, crack, rot, or blister – maintaining its strength and beauty for life. 1 Washington Street was completed in December 2017.